TELL REP. ALLEN AND REP. PAYNE: HB 2270 DESERVES A HEARING! Arizona has the fourth highest incarceration rate and a corrections budget of $1.1 billion. Our state incarcerates more people for longer periods of time than neighboring states and it's not making us any safer. If Arizona's imprisonment rate matched Utah’s, it would save more than $600 million a year, according to a report by FWD.us. That's nearly the full cost of a 20 percent increase in teacher pay across the state. Arizona's harsh sentencing laws contribute to its mass incarceration crisis. Arizona's practice of requiring all people to serve 85 percent of their sentence—regardless of the severity of the offense or their attempts to rehabilitate themselves—is costly, ineffective, and outdated. Arizona is one of the only states that has this extreme sentencing law. HB 2270 will allow people who've made significant progress in prison to earn their way to an earlier release date, so they can be reunited with their families and start contributing to their communities sooner. It will restore hope to incarcerated individuals and their families and give them an incentive to take part in rehabilitative programming. HB 2270 is the smart approach to criminal justice. Tell Representative John Allen and Representative Kevin Payne to give HB 2270 a hearing! Arizona's practice of requiring all people to serve 85 percent of their sentence—regardless of the severity of the offense or their attempts to rehabilitate themselves—is costly, ineffective, and outdated. Arizona is one of the only states that has this extreme sentencing law and it is not making us any safer. It is one reason why Arizona has the fourth highest incarceration rate and a corrections budget of $1.1 billion. HB 2270 will allow people who've made significant progress in prison to earn their way to an earlier release date, so they can be reunited with their families and start contributing to their communities sooner. I support HB 2270 because it will restore hope to incarcerated individuals and their families. If people have an opportunity to earn their way to an earlier release, they will have an incentive to take part in programming and start the road to rehabilitation sooner. Arizona's criminal justice system is out of line with the rest of the nation. We must take immediate action to safely lower our prison population and reduce recidivism. Please give HB 2270 a hearing. 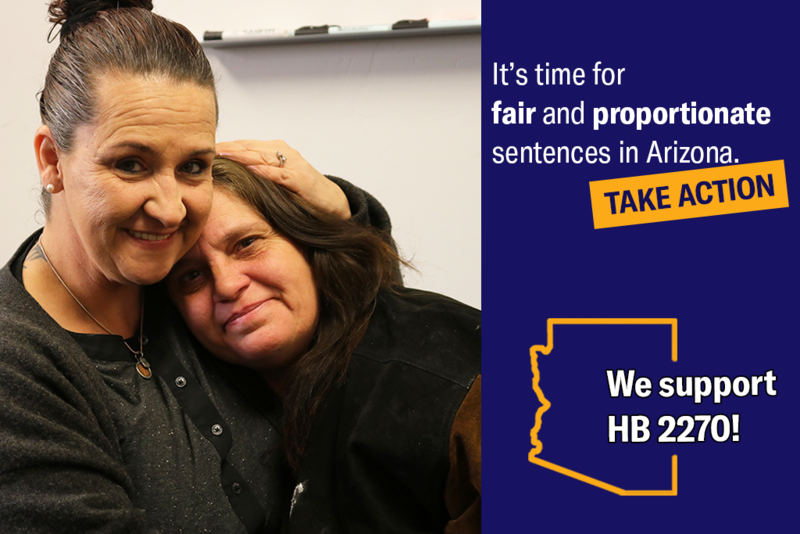 It is the first step toward making Arizona a place that invests in people, not prisons.